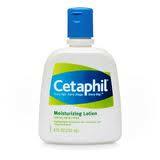 Cetaphil lotion comes in a pump bottle so it is easy to put by your night stand, on your desk, or in your bathroom to pump out whenever your skin is feeling a little dry. There are a lot of advantages that I found to using this method over other methods, and this will leave a lot less mess in general as long as you manage to catch the lotion every time. It is a great product for moisturizing your skin, but if you have a serious condition; it will only do so much for rashes and other more devastating skin conditions. All this is, is a moisturizer and not a clinical strength rash reliever. It is fragrance free and comes with emollients and humectants which help to repair damaged skin, and seal in moisture to prevent excessive dryness. It has a water and glycerine base like most other lotions. I got this mainly for eczema relief, so my opinion is biased, but it did not help to relieve those symptoms. My skin still felt itchy and burning for much time after using it. However it was great when I used it on dry areas of my body and helped to seal in moisture. If all you have is a little dry skin then this is great, but it won’t get rid of your rashes and red itchy skin. Cetaphil restoraderm eczema cream has worked wonders on my eczema in just a few days; my eczema looks and feels better than it has in a couple of years.